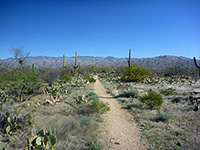 Most trails in the Rincon Mountain district of Saguaro National Park are in the northwest corner - a few along the one road through the park, the Cactus Forest Drive, one in Rincon Valley to the south, and a complex network of inter-connecting routes on the north side of Tanque Verde Ridge. In this latter region, a typical hike involves combining parts of two or more trails to form a loop. The extensive backcountry to the east is crossed by seven main trails which also intersect, and link with paths in the neighboring Coronado National Forest. Horse riding is permitted on most of the shorter trails. The Rincon Mountain map shows the location of all trails; shorter hikes are indicated by the number. For paths in the other half of the park, see the Tucson Mountains hiking index. 1 Cactus Forest 5.5 250 The Cactus Forest Trail crosses most of the west side of the park, from a trailhead along Broadway Road in the north to one along Freeman Road in the south. Starting at Broadway the path climbs very gradually through flat cactus desert, over several dry washes and past junctions with the Cholla, Mica View & Mesquite trails, and reaches the north side of the Cactus Forest Drive after 2 miles. The next 2.5 miles are over slightly more uneven ground to the south side of the loop, then the final mile to Freeman Road descends a little along a dry wash. The scenery is similar along the whole trail, so walking just a section of it is enough for a good appreciation of the saguaro landscape. Within the loop drive is a 0.3 mile side path to Lime Falls, a small drop on a seasonal stream but quite dramatic on the rare occasions when water is flowing. 2 Cholla 0.7 level One of many short paths in the low elevation northwest corner of the park, the Cholla Trail links the Cactus Forest and Loma Verde trails, crossing one dry wash, and forming part of several popular loop hikes. 3 Coyote Wash 1.8 50 Minor path that follows a seasonal wash close to the south edge of the park; forms a 4 mile loop with the Ruiz Trail. 4 Desert Ecology 0.25 (loop) level Along the Cactus Forest Drive, the paved Desert Ecology Trail loops through flat land beside a dry wash, and has interpretive notices describing the main plants and animals which inhabit the Sonoran Desert. 5 Freeman Homestead 1 (loop) 100 This unpaved loop trail starts along the short side road to the Javelina picnic area, at the southernmost part the Cactus Forest Drive, and leads to the site of a house built by settlers in 1930. The only remains are earthen mounds marking the line of the walls and a large non-native tree planted for shade, but along the way are many huge saguaros, and information notices about adapting for life in the desert. 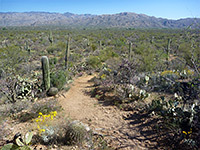 overall One of four paths accessed from the lesser used Loma Alta trailhead at the southwest corner of the Rincon Mountain District, the Hope Camp Trail runs along an old vehicle track, close to two tributaries of Rincon Creek, through bushy land and some riparian areas, still with many large saguaros. The trail passes two abandoned cattle stations - Deer Camp after 1.25 miles and Hope Camp at the end, from where the North Hope Trail continues for 0.4 miles, across level, open ground that allows good views of the surrounding hills. Other interesctions are with the Coyote Wash, Ruiz and Quilter trails, this latter forming part of the cross-state Arizona Trail. 7 Loma Verde 2.2 120 Running across the northwestern corner of the park, the Loma Verde trail has a gentle gradient as it crosses undulating sandy land and small washes, in the shadow of the Rincon Mountains. The southern trailhead is along Cactus Forest Drive, from where the path heads north, past regular intersections with other trails (Squeeze Pen, Cholla, Pink Hill and Wentworth) before ending at a junction with the Shantz Trail. Various loop trails are possible, the shortest at 3 miles. 8 Mesquite 1.0 level The one mile Mesquite Trail connects the Cactus Forest and Loma Verde routes; it branches west off the latter, runs close to the one-way loop drive for a while then veers northwest across a dry wash and on to a junction with the former, from where the Mica View Trailhead is half a mile north. 9 Mica View 1 40 The Mica View picnic area is located at the end of a gravel spur road along the north part of the Cactus Forest Loop. From the car park, an easy trail crosses a flat part of the desert with many saguaros, cholla and other opuntia cacti, ending at an alternative trailhead on Broadway Boulevard. A loop hike of 2 miles can be made by turning right, on the Shantz Trail briefly then south along the Cactus Forest Trail for a mile, to a junction with the southern end of the Mica View Trail. overall This connecting trail links the Shantz and Squeeze Pen routes, crossing a mix of overgrown, bushy land either side of three dry washes, and higher, more open plains with a good selection of cacti. 11 Ridge View 1.1 330 The short Ridge View Trail climbs to a small hill below Tanque Verde Ridge, giving unobstructed views across Rincon Valley towards the Rincon Mountains. The trailhead is at the end of Camino Loma Alta, the same starting point as the Hope Camp Trail. 12 Ruiz 2.1 400 Path over undulating terrain with good views and plenty of saguaro, close to the south edge of the park, accessed via the Hope Camp Trail from the Loma Alta trailhead; forms a 4 mile loop with the Coyote Wash Trail. 13 Shantz 4.8 50 Shantz is the closest trail to the park boundary, in the northwest corner, running across flat cactus groves beneath the foothills of the Rincon Mountains - from the Mica View/Cactus Forest road junction to the trailhead for the backcountry Douglas Spring Trail, on Speedway Boulevard. 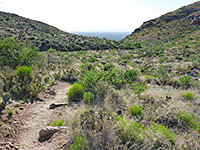 Like most paths in the area, parts of the Shantz Trail are combined with other routes to form loop hikes of varying lengths; major intersections are with the Mica View, Cactus Forest, Loma Verde and Kennedy trails. 14 Squeeze Pen 2.2 80 Starting a short way along the Loma Verde route, from the trailhead along the Cactus Forest Loop, the Squeeze Pen Trail is for a while the closest trail to the Rincon Mountains, so its higher elevation makes for the best overall views of the northwest section of the park. After 1.2 miles it turns away north down a dry wash, past a junction with the Pink Hill Trail (part of a 3 mile loop back to the start, also using part of the Loma Verde Trail), and ends at another intersection, with the Wentworth and Kennedy paths. 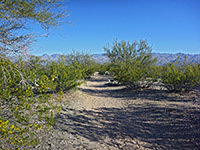 Further east, route closest to the mountains is then the Carrillo Trail, and later the Three Tank Trail, which joins the backcountry path to Douglas Spring. There are many short criss-crossing paths through the saguaro in this area. 15 Wentworth 3.3 100 The Wentworth Trail runs generally west-east through park's northwest corner, past nine intersections in addition to the junctions at start and finish (with the Shantz and Douglas Spring trails). Cowhead Saddle 4 1,800 From the junction of the Douglas Spring and Tanque Verde Ridge trails, the Cowhead Saddle route gains another 1,800 feet as it climbs deeper into the Rincon Mountains, through thick forests of ponderosa pine. After 3 miles, beneath Helens Dome, are junctions with 2 northwards trails (Mica Mountain and North Slope), while 2 more paths fork off at Manning Cabin, location of a primitive campsite, and the end of the Cowhead Saddle Trail. Douglas Spring 8.8 3,550 The Douglas Spring Trail provides a slightly shorter and less steep route into the backcountry of Saguaro National Park compared to the other main path (Tanque Verde Ridge), though this is still a strenuous hike. 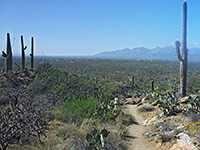 The trailhead is at the east end of Speedway Boulevard, in a flat region of dense saguaro, but after a short distance the path begins to climb beside a narrow, rocky wash into the foothills, where it quite soon passes four junctions with other trails, part of a complex network of paths in this section of the park. After the last of these (the Three Tank Trail), 2.2 miles from the start, the saguaro fade away and are replaced by creosote bushes, yucca and mesquite trees. A 0.3 mile side path reaches Bridal Wreath Falls - occasionally a powerful waterfall but usually just a trickle. At 4,800 feet and 6.5 miles from the start, the trail passes Douglas Spring campground, beside a seasonal spring in Canyon del Pino; after here, the final 2 miles is a steep climb up to the top of Tanque Verde Ridge, and a junction with the Cowhead Saddle Trail. Heartbreak Ridge 5.7 2,160 Heartbreak Ridge is the unofficial name of the central section of the Rincon Mountains, between Rincon Peak and Mica Mountain. One trail runs along, providing the only link between the southeast and northeast parts of the national park; the south end (6,080 feet) is at the junction of the Rincon Peak and Rincon Creek trails (Happy Valley Saddle), from where the Heartbreak Ridge Trail climbs northwards, up and over several small summits and ends with a steeper ascent to another junction, with the Fire Loop Trail. This part of the park, in deep pine woodland beneath Mica Mountain, has many intersecting paths but the three main cross-country routes are west to Douglas Spring/Tanque Verde Ridge, north to Italian Spring and east to Turkey Creek. Miller Creek 4.5 1,960 The remote Miller Creek Trail begins outside Saguaro National Park in Happy Valley on Coronado National Forest land, along FR 35 and about 16 miles north of I-10, exit 297 (Mescal Rd). For over a mile the path is through thick vegetation beside the creek, and almost level, but then begins a steady climb up a steep, manzanita-covered hillside, ending at a junction with the Heartbreak Ridge Trail. Rincon Peak 3.2 2,300 At 8,482 feet, Rincon Peak is the 3rd highest summit in Saguaro National Park, after Mica Mountain and Spud Rock. The shortest route to the top begins east of the park with a 4.5 mile hike along the Miller Creek Trail, then half a mile south on the Heartbreak Ridge Trail to another junction. The west fork descends down Rincon Creek back to the saguaro desert while the main branch - the Rincon Peak Trail - heads southwards, getting ever steeper and passing through pine forest of increasing height until the trees fade away near the summit to reveal outstanding views in all directions. The trail is not often used and overgrown in parts but the hike to the summit should be possible as a long day hike. Tanque Verde Ridge 11 3,900 Along with the Douglas Spring route, the Tanque Verde Ridge Trail is the main path into the high elevation backcountry of the Rincon Mountain district, climbing nearly 4,000 feet to pass Tanque Verde Peak after 9 miles, then on 2 more miles to a 4-way junction with the Douglas Spring and Cowhead Saddle trails. For most of the route the path follows the top of the ridgeline, so enjoying uninterrupted views to the north, west and south, over the park, the surrounding mountains and the city of Tucson. Just a short hike of a mile or so is rewarding enough, though the round trip to the peak (18 miles), passing through 6 discrete wildlife zones, can be done in one day. The first 0.8 miles is up the side of the ridge to the top, whereupon the path turns northeast and is mostly straight all the way to the peak. Saguaro grow densely up to around 4,000 feet (2.5 miles), then are gradually replaced by grass and various types of bushes. At 5,500 feet the first pine and oak trees appear, and grow taller as the peak approaches. The first campsite along the trail is reached after 7 miles at Juniper Basin (6,000 feet). Turkey Creek 6 2,000 Half a mile past the parking area for the path up Miller Creek, forest road 35 reaches a short side track that leads to the Turkey Creek Trail; the track passes through woodland around the creek for a mile then becomes a regular footpath once it begins to ascend a grassy ridge to the north. The climb is mostly quite gentle, passing gradually through scrubland, juniper/oak trees and finally ponderosa pine forest at the highest elevation. The path ends at a junction with the Deer Head Spring Trail, from where other paths link with the main intersection in this part of the park, at the north end of the Heartbreak Ridge Trail, 0.8 miles west.